American Apparel, the vertically integrated clothing manufacturer based in downtown Los Angeles, is launching an initiative to support gay marriage in France. 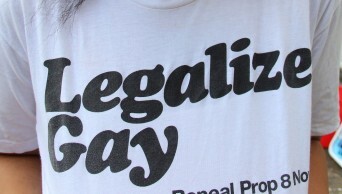 At the request of its French employees who have been eagerly following the country’s efforts to legalize gay marriage, American Apparel will be giving away 10,000 Legalize Gay shirts in its stores and on the streets of Paris. Despite support from French President Francois Hollande, progress towards the full legalization of gay marriage has faced tough opposition from religious and political groups. Recently, conservative organizations have sponsored petitions against gay marriage and proposed various exemptions in an effort to undermine potential bills. Though polls currently show that a majority supports the passing of gay marriage laws, these numbers have declined in light of strenuous campaigning from opposing groups. Posted December 15th, 2012 & filed under Activism.